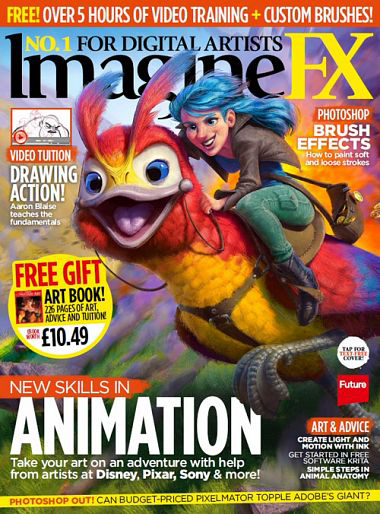 In this issue I found a few fantastic articles that gave me new insights into a variety of different Animation professions and skills. A unique article I enjoyed was on giving advice to Illustrators on making a smooth transition into an Animation career (pp. 20-22). The skills Illustrator's have already (anatomy, composition, color theory, lighting, strong drawing and painting skills) are assets in the Animation field, and other must have skills include: knowledge of film, animation, literature, history and music, ability to take art direction, dependability, friendliness and working well with others. Knowledge of composition and mood, strong silhouette and character motivation make for great character shots. Having a story to tell and a passion for storytelling is huge. Other key assets include: understanding of movement, character and figure drawing, camera staging, lighting and acting composition. They even went as far as to say whatever background you have in art, there is something unique about it that it could also be an asset to staking an Animation career. My favorite tip is, "do great work, and be great to work with," a simple statement but a huge challenge. The biggest difference between the two careers is that illustrators fly solo and have more control over their own time, while animation professionals are always collaborating and under the gun, those may be the hardest transition areas. 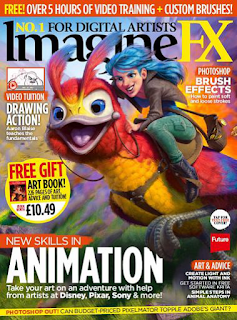 To my surprise, my favorite article was the interview with CG animator, In-Ah Roediger (pp. 42-47). The more I hear from women in full time film animation careers, the more I realize I am glad I don't have to work full time. 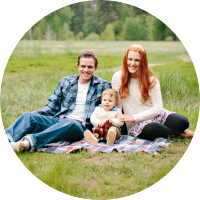 I was delighted to read In-Ah's article especially since she had a baby the same year I did! It was awesome to get her perspective and to hear how she wants to make a change from full-time film animation to full time mom and keeping up her skills as an art professor. The Bible Project (p. 53), currently in production, is a collaboration between artists and theologians to summarize every book in the Bible in a 5 min. illustrated short. The collaboration is between Art Studio, Sincerely Truman, Board of Directors Gerry Breshears and Pastor Tim Mackey. Reading the Animation tutorial (pp. 65-68) was a fun refresher and reminder of my spectacular post-grad experience learning traditional animation with Walt Disney Animation Studios very own Alex Topete. The tutorial on color keys was right up my alley, reminding me of Nathan Fowkes classes, and one of my favorite tutorials yet. Great advice and step by step on lighting a scene, and creating different moods with color. Again James Gurney has a tutorial in traditional mediums covering dinosaurs (p. 95), one which I will have to tuck away for later. After reading a review, I would love to check out the newly released Harry Potter book showcasing behind the scenes and concept art from the films. Tied with my other favorite, I loved reading about the background of a former Character Design teacher of mine, the extremely successful, David Coleman (p. 114). I had no idea he had no formal training and is almost completely self taught, what an accomplishment! His advice, tips, and insights are truly inspirational!! !